Say you’re a contractor and your company builds brick walls. 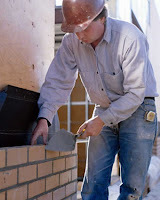 Most of your bricklayers lay about 3 bricks per minute and make about $8 per hour. (You can think of this as the replacement level.) But along comes a guy who lays bricks twice as fast--6 bricks per minute. How much would you be willing to pay him? Simple fairness suggests $16 per hour. Certainly no more than that because you could just replace him by hiring two replacement-level guys and get the same production. So in this example rewards are based on absolute differences in productivity. Large differences in productivity result in large differences in rewards. Similarly, small differences in bricklaying ability would result in small differences in hourly pay. 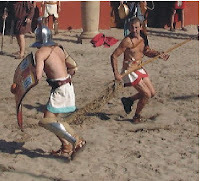 Now consider two ancient gladiators entertaining the emperor in combat. Even if one gladiator is only slightly better than the other, he’ll very likely win, and the differences in rewards could be extreme. Here, in a winner-take-all system, absolute differences in ability do not matter, only relative differences. What about sports like football? First, in many ways the NFL is a winner-take-all system. Whoever wins the game earns 100% of the win while the loser eats all of the loss, and there is only one champion left standing at the end of the season. Second, football players are not like bricklayers. You cannot replace an All-Pro QB by sending two average QBs out on the field and expect the same productivity. When there is a constraint on the number of people that can be employed at one time, the value of the most productive people rapidly increases. And when there is a constraint on the number of contributors combined with a winner-take-all reward structure, the value of the top performers will skyrocket. This is why the top NFL draft picks make so much more than the lower picks. Even if the abilities of the top picks are only marginally better than those of the picks in later rounds, there will be very large differences in pay. It’s not much different than CEO compensation. If a company is in competition with other companies for market share, the shareholders should want the best CEO they can get--especially because a competitor with a slightly more visionary CEO will likely steal market share, even if your guy is still top-notch. And since you can’t replace a single chief executive with two average guys or a whole mob of slackers, the CEO’s pay is going to end up being wildly disproportionate to his actual ability. There can be only one guy at the top, only one winner of the tournament. Note that I’m not claming that rookie salaries should be this high, just trying to understand why they’re so high. And I’m not comparing rookie pay to veteran pay. That’s another topic for another day.